CUPERTINO, California—January 22, 2008—Apple® today announced that it is adding a gorgeous new pink iPod® nano to the lineup of the world’s most popular music player. 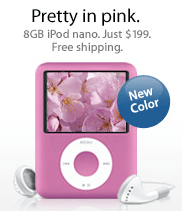 The much-requested pink iPod nano is available immediately in an 8GB model for $199. iPod nano features a two-inch display which lets users watch the brand new iTunes® Movie Rentals, or TV shows and music videos purchased from the iTunes Store. iPod nano delivers up to 24 hours of audio playback or five hours of video playback on a single charge* and is encased in a beautiful all-metal design made with anodized aluminum and polished stainless steel, which is also available in silver, black, blue, green and a (PRODUCT) RED special edition. iPod nano features an enhanced user interface that shows off album artwork and photos like never before and includes Cover Flow®, so you can scroll through your entire music collection by album cover artwork using the Click Wheel. Customers can also buy music, video and games for their iPod nano from the iTunes Store or check out the latest iTunes Movie Rentals. The new pink 8GB iPod nano is available worldwide immediately for a suggested retail price of $199 (US) and joins the other 8GB models available in silver, black, blue, green and a (PRODUCT) RED special edition. The 4GB iPod nano in silver is available for a suggested retail price of $149 (US). Both the 4GB and 8GB iPod nano for Windows or Mac® are available through the Apple Store® (www.apple.com), Apple’s retail stores and Apple Authorized Resellers. All iPod nano models include earbud headphones, a USB to 30-pin cable and a Universal Dock Connector. iPod nano requires a Mac with a USB 2.0 port, Mac OS® X v10.4.9 or later and iTunes 7.6; or a Windows PC with a USB 2.0 port and Windows Vista or Windows XP Home or Professional (Service Pack 2) or later and iTunes 7.6. Internet access is required and a broadband connection is recommended, fees may apply. The iTunes Store is not available in all countries. iTunes Movie Rentals are available in the US only. *Battery life and number of charge cycles vary by use and settings. See www.apple.com/batteries for more information.